Curiosity Shop was founded in 2014 to create a weird, fun, and unique creative environment for tattooing, tinkering, art creation, and to house our collection of vintage and antique ephemera. Tattoo veterans Hannah Aitchison and Scott White wanted a place to call home, and where their clients could feel comfortable and inspired by the offbeat and wonderful art and antiquities that Scott and Hannah have collected over the years. We plan to host a variety of workshops and events here, as well as gallery showings and a tinkering space for the mechanically minded. There is very little we don't get excited about and want to try at least once. Whether you're looking for one-of-a-kind custom artwork to wear on your body, or to hang on your wall, chances are you'll be right at home at Curiosity Shop. 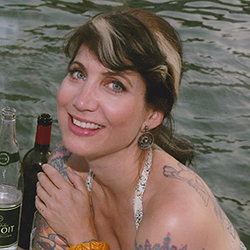 Her career has given her many wonderful opportunities to represent the tattoo trade in TV, radio and print, including many seasons on the successful shows "LA Ink" and "Best Ink". Hannah loves to incorporate a variety of visual influences into her highly colorful work. She also loves knitting, dogs, things that go fast, travel, all things vintage, etymology and lawn darts. Also an 20-year industry veteran, Scott "Corn Guy" White is as well known for his infamous left arm (sleeved with corn) as he is for his tattooing and tinkering skills. Happy to take on virtually any mechanical or artistic challenge, Scott brings a great creative energy and enthusiasm to any project he tackles. Scott enjoys mechanical and engineering conundrums, tinkering of all types, cars and motorcycles, dogs, travel, teleportation and Hannah's cooking. Roller-derby knitting goddess, mum and tattoo dynamo Jessi Cramer specializes in elegant, beautifully rendered fine line blackwork. Bring her your most challenging fine line concept and she's guaranteed to kill it, with a big smile and a hot mug of black coffee at her side. For most recent updates to her portfolio, please visit her Instagram page by clicking HERE! Hannah also enjoys many varieties of French alcohol while on board ship. We are so happy Jessi works with us meow!